In this blog Skhue Ncube introduces her research focus on Blue-Green infrastructure and natural capital as part of the Urban Flood Resilience project. Natural capital and ecosystem services concepts are a popular way of describing the multiple benefits we get from the natural environment. The publication of the Millennium Assessment in 2005 has, along with national publications such the UK National Ecosystem Assessment (2011), raised the profile of these concepts. Natural capital refers to the stock of natural features/assets, e.g. freshwater, land, soil, minerals, air, seas, habitats, biodiversity and processes which together provide the foundation for the flows of ecosystem services (Guerry et al., 2015; Natural Capital Committee, 2015; Rouquette, 2016) (Figure 1). Ecosystem services are the flows of benefits such as food, flood regulation, climate regulation and recreational opportunities that people gain from natural ecosystems (Constanza et al., 2017). Both global and national trends show that natural capital is declining due to human influenced land use changes such as urbanisation and natural resource depletion (Natural Capital Committee, 2015; Holt et al., 2015). Understanding of these concepts have led to an interest in the development of suitable metrics, models, datasets and tools for measurement of natural capital as well as assessing how it is changing over time. The Natural Capital Committee suggests the concept of natural capital be tried in core environmental contexts such as urban settings. Although urban expansion/intensification impacts on natural capital and the multiple benefits available to the urban population, it is recognised that Blue-Green infrastructure (e.g. rain gardens, swales, ponds etc.) can at least reduce these impacts (Hansen and Pauleit, 2014). While ecosystem services knowledge is already in use in urban planning, especially the multiple benefits from Blue-Green infrastructure systems (Meerow and Newell, 2017; O’Donnell et al., 2017), there is still need for natural capital assessments at relevant scales to inform planning decisions and outcomes (Cortinovis and Geneletti, 2018). Furthermore, the multifunctionality of Blue-Green infrastructure beyond addressing one main issue such as urban flooding has not been adequately explored and accounted for (Cortinovis and Geneletti, 2018). Nonetheless, Blue-Green infrastructure are often promoted on their multifunctionality potential compared to grey infrastructure (Hansen and Pauleit, 2014). The multifunctionality of green infrastructure is mostly traded-off for locational/technical/physical factors which influences the multiple benefit areas among urban communities. The question is whether such multiple benefits are located where they are needed the most or located in technically suitable areas. While the quality and quantity of green infrastructure is important, the Natural Capital Committee also argues that its distribution and equity is of equal importance as it is usually the poor who lack access to good quality green infrastructure and associated multiple benefits. To investigate how different Blue-Green infrastructure investment pathways and future land use change scenarios affect the dynamic evolution of natural capital in the London Borough of Sutton. Compare the technical suitability location of Blue-Green infrastructure to where the multiple benefits from such interventions are needed the most (demand areas) in a locality as identified by local stakeholders. The case study area in the London Borough of Sutton is primarily a residential area which has significantly expanded over time, with plans to further introduce more housing units in the next three decades. As a result of such growth, the existing drainage network has exceeded its capacity and recent extreme rainfall events have led to increased flooding incidents. To address these challenges, the local authority intends to integrate Blue-Green infrastructure with existing grey infrastructure to reduce the flood risk. 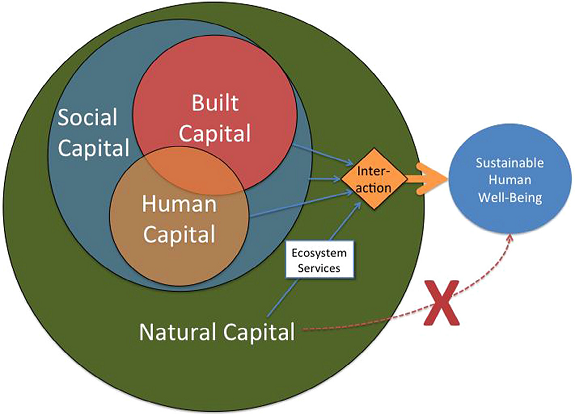 The natural capital assessment approach for this research is outlined in Figure 2. This study will utilise tools such as the Natural Capital Planning Tool (NCPT) and the Benefits of SuDS Tool (BeST) (CIRIA, 2015) to assess the impact score of proposed developments on natural capital and ecosystem services. A GIS based analysis will be used to evaluate current and future natural capital spatio-temporal changes associated with different Blue-Green infrastructure investment pathways. There is growing interest in using practically applicable analytical tools that link the natural environment and society. A wide range of tools have recently been developed to analyse ecosystem services, natural capital and green infrastructure (see Tool Assessor). This research focusses on natural capital assessments and opportunities associated with different Blue-Green infrastructure systems for urban resilience and sustainability in light of future uncertainties associated with climate change, demographic changes etc. When undertaken as part of wider environmental assessments, natural capital assessments could ensure that natural capital is considered alongside built, financial, social and human capital in sustainable urban development. Such an assessment could also aid planners and decisions makers to further understand the interdependency between the natural environment, economy and society in the planning process. Dr Skhue Ncube is a Research Associate at Heriot-Watt University, and part of the Urban Flood Resilience research consortium. The source of the figures used in this blog are cited. The featured image is labelled for non-commercial reuse. CIRIA. 2015. Benefits of SuDS Tool (BeST). CIRIA, UK. Cortinovis C and Geneletti D. 2018. Ecosystem services in urban plans: What is there, and what is still needed for better decisions. Land Use Policy, 298-312. Costanza, R., de Groot, R., Braat, L., Kubiszewski, I., Fioramonti, L., Sutton, P., Farber, S. & Grasso, M. 2017. Twenty years of ecosystem services: How far have we come and how far do we still need to go? Ecosystem Services, 28: 1-16. Grêt-Regamey, A., Altwegg, J., Sirén, E. A., Van Strien, M. J. & Weibel, B. 2017. 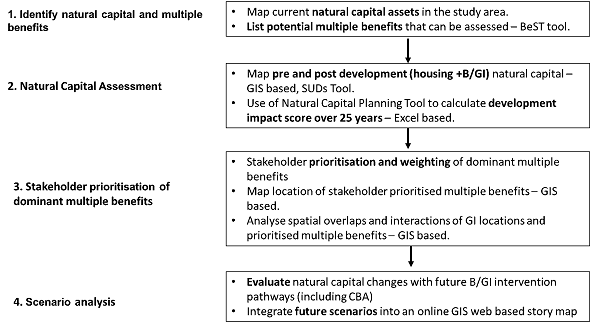 Integrating ecosystem services into spatial planning—A spatial decision support tool. Landscape and Urban Planning, 165, 206-219. Guerry, A. D., Polasky, S., Lubchenco, J., Chaplin-Kramer, R., Daily, G. C., Griffin, R., Ruckelshaus, M., Bateman, I. J., Duraiappah, A., Elmqvist, T., Feldman, M. W., Folke, C., Hoekstra, J., Kareiva, P. M., Keeler, B. L., Li, S., Mckenzie, E., Ouyang, Z., Reyers, B., Ricketts, T. H., Rockström, J., Tallis, H. & Vira, B. 2015. Natural capital and ecosystem services informing decisions: From promise to practice. Proceedings of the National Academy of Sciences, 112, 7348-7355. Hansen, R. & Pauleit, S. 2014. From Multifunctionality to Multiple Ecosystem Services? A Conceptual Framework for Multifunctionality in Green Infrastructure Planning for Urban Areas. Ambio, 43, 516-529. Holt, A. R., Mears, M., Maltby, L. & Warren, P. 2015. Understanding spatial patterns in the production of multiple urban ecosystem services. Ecosystem Services, 16, 33-46. Lennon, M., & Scott, M. 2014. Delivering ecosystems services via spatial planning: Reviewing the possibilities and implications of a green infrastructure approach. Town Planning Review, 85(5), 563–587. Meerow, S., and Newell, J.P. 2017. 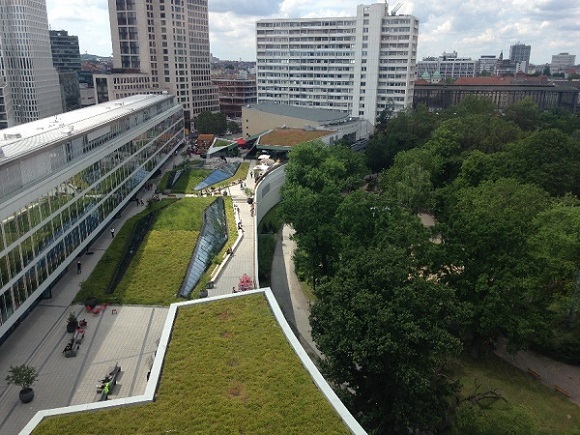 Spatial Planning for multifunctional green infrastructure: Growing resilience in Detroit. Landscape and Planning, 159, 62-75. Millennium Ecosystem Assessment. 2005. Ecosystems and Human Well-being: Synthesis. Washington (DC): Island Press. Morgan, M. and Fenner, R. 2017. Spatial evaluation of the multiple benefits of sustainable drainage systems. Proceedings of the Institution of Civil Engineers – Water Management, 0, 1-14. Natural Capital Committee. 2015. The state of Natural Capital: Protecting and improving natural capital for prosperity and well-being, Third Report to the Economic Affairs Committee, England. Natural Capital Planning Tool. 2018. O’Donnell E, Woodhouse R and Thorne C. 2017. Evaluating the multiple benefits of a Newcastle surface water management scheme. Proceedings of the Institution of Civil Engineers – Water Management, http://dx.doi.org/10.1680/jwama.16.00103. Rouquette, J.R. 2016. Mapping Natural Capital and Ecosystem Services in the Nene Valley. Report for the Nene Valley NIA Project. Natural Capital Solutions. UK National Ecosystem Assessment. 2011. The UK National Ecosystem Assessment Technical Report. Cambridge (UK): UNEP-WCMC.